I was kidding. But, apparently, this is going to happen. 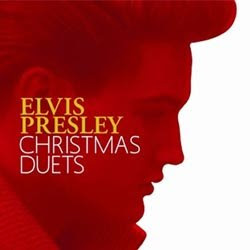 Elvis Presley Christmas Duets is what they’re calling the album and it’s going to pair Elvis’s voice with the likes of people he wouldn’t otherwise associate himself…y’know, since he’s dead. 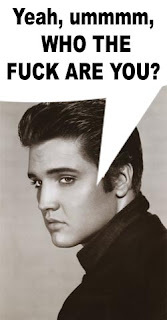 Is it just plain brutal that Elvis will have to sing a song with Gretchen Wilson? Way to tarnish a legacy. My biggest problem with posthumous recording, other than the fact that it’s just another way to stretch an artist for all he or she is worth in terms of revenue, isn’t so much that their creative property winds up utilized and manufactured in every way, shape or form. Any artist would, or at least SHOULD, know that going into ANY contract, their legacies, no matter how seemingly sacred, are up for grabs at any price and potentially subject to a slew of refashions, rehashings, reshapings, reissues…you name it. My problem is that these artists, because of their understandably inanimate conditions, have no choice but to become vehicles for whatever up and coming Pop stars their respective record labels select. Elvis is, consequently, promoting American Idol now because somebody in the Penthouse thought that Carrie Underwood was an appropriate candidate for an album like this. Were he alive, would he protest? Maybe not, but it’s not as if he has any say in the matter. He’s adding a dash of credibility to a fourth-rate Country star while having his taste and preferences dictated to him by the living. Also, while enhancing her name, Presley is in no position to keep his own intact. Granted, it would take more than “singing” with Underwood to damage the Presley legacy, but why put it to the test? Plus, with the exceptions of Ann Murray and Amy Grant to an extent, maybe Olivia Newton-John because she was at least relevant before and after The King offed himself, the roster largely consists of country acts that Elvis never met, heard…a couple of them weren’t even alive. Admirers or not, would Elvis actually have worked with these performers if he wasn’t dead? Sony BMG, the label working with Elvis Presley Enterprises Inc. on this project, is billing it as Elvis’s first duets album. The fact that he didn’t do one while he was still in the pink sort of says it all. So, Puffy, when can we expect the next Biggie album?